If we are talking creativity and ideas, Bill Gates is an American unoriginal. He is Microsoft's chief and co-founder, he is the world's richest man, and his career delivers this message: It can be wiser to follow than to lead. Let the innovators hit the beaches and take the losses; if you hold back and follow, you can clean up in peace and quiet. Gates is the Bing Crosby of American technology, borrowing a tune here and a tune there and turning them all into great boffo hits — by dint of heroic feats of repackaging and sheer Herculean blandness. Granted he is (to put it delicately) an unusually hard-driving and successful businessman, but the Bill Gates of our imagination is absurdly overblown. Yet we have also been unfair to him. Few living Americans have been so resented, envied and vilified, but in certain ways his career is distinguished by decency — and he hasn't got much credit for it. Technology confuses us, throws us off the scent. Where Gates is concerned, we have barked up a lot of wrong trees. A 1968 photo shows Bill as a rapt young teenager, watching his friend Paul Allen type at a computer terminal. Allen became a co-founder of Microsoft. The child Gates has neat hair and an eager, pleasant smile; every last detail says "pat me on the head." He entered Harvard but dropped out to found Microsoft in 1975. Microsoft's first product was a version of the programming language BASIC for the Altair 8800, arguably the world's first personal computer. BASIC, invented by John Kemeny and Thomas Kurtz in 1964, was someone else's idea. So was the Altair. Gates merely plugged one into the other, cream-cheesed the waiting bagel and came up with a giant hit. By 1980, IBM had decided to build personal computers and needed a PC operating system. (Computers are born naked; they need operating systems to be presentable.) Mammoth, blue-chip IBM employed thousands of capable software builders, and didn't trust a single one of them; IBM hired Microsoft to build its operating system. Microsoft bought Q-DOS from a company called Seattle Computer Products and retailored it for the PC. The PC was released in August 1981 and was followed into the market by huge flocks of honking, beeping clones. Microsoft's DOS was one of three official PC operating systems but quickly beat out the other two. DOS was clunky and primitive at a time when the well-dressed computer was wearing UNIX from Bell Labs or (if its tastes ran upscale) some variant of the revolutionary window-menu-mouse system that Xerox had pioneered in the 1970s. But despite (or maybe because of) its stodginess, DOS established itself as the school uniform of computing. It was homely, but everyone needed it. Once again, Gates had brokered a marriage between other people's ideas and come up with a hit. DOS was even bigger than Basic. Gates had it made. Apple released the Macintosh in January 1984: a tony, sophisticated computer was now available to the masses. Henceforth DOS was not merely homely, it was obsolete. But it continued to rake in money, so what if the critics hated it? In May 1990, Microsoft finally perfected its own version of Apple windows and called it Microsoft Windows 3.0 — another huge hit. Now Gates really (I mean really) had it made. By the early '90s, electronic mail and the Internet were big. Technologists forecast an Internet-centered view of computing called "mirror worlds." Technophiles enthused about the "information superhighway." The World Wide Web emerged in 1994, making browsers necessary, and Netscape was founded that same year. Sun Microsystems developed Java, the Internet programming language. Gates hung back. It wasn't until 1996 that Microsoft finally, according to Gates himself, "embraced the Internet wholeheartedly." Why lead when you can follow? Microsoft's first browser, Internet Explorer 1.0, was licensed from a company called Spyglass. It was an afterthought, available off the shelf as part of a $45 CD-ROM crammed with random tidbits, software antipasto, odds and ends you could live without — one of which was Explorer. 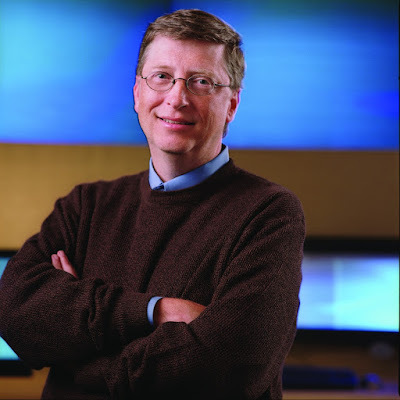 Today Microsoft is the world's most powerful supplier of Web browsers, and Gates really has it made. The U.S. Justice Department is suing Microsoft for throwing its weight around illegally, hitting companies like Netscape below the belt. The trial is under way. Whoever wins, Gates will still be the No. 1 man in the industry. The world pondered Gates and assumed he must be a great thinker. During World War II, Cargo Cults flourished on New Guinea and Melanesia: people who had never seen an airplane pondered incoming U.S. aircraft and assumed they must be divine. Technology is confusing, and these were reasonable guesses under the circumstances. In 1995 Gates published a book (co-authored with Nathan Myhrvold and Peter Rinearson) called "The Road Ahead." Peering far into the future, he glimpsed a technology-rich dreamworld where you will be able to "watch Gone With the Wind," he wrote, "with your own face and voice replacing Vivien Leigh's or Clark Gable's." Apparently this is just what the public had been dying to do, for "The Road Ahead" became a runaway best seller, though it is lustrous with earnest goofiness, like a greased-down haircut. And yet we tend to overlook (in sizing him up) Gates' basic decency. He has repeatedly been offered a starring role in the circus freak show of American Celebrity, Julius Caesar being offered the Emperor's crown by clamorous sycophants. He has turned it down. He does not make a habit of going on TV to pontificate, free-associate or share his feelings. His wife and young child are largely invisible to the public, which represents a deliberate decision on the part of Mr. and Mrs. If postwar America of the 1950s and '60s democratized middle-classness, Gates has democratized filthy-richness — or has at least started to. Get the right job offer from Microsoft, work hard, get rich; no miracle required. Key Microsoft employees pushed Gates in this direction, but he was willing to go, and the industry followed. The Gates Road to Wealth is still a one-laner, and traffic is limited. But the idea that a successful corporation should enrich not merely its executives and big stockholders but also a fair number of ordinary line employees is (although not unique to Microsoft) potentially revolutionary. Wealth is good. Gates has created lots and has been willing to share. Today Gates, grown very powerful and great, sits at the center of world technology like an immense frog eyeing insect life on the pond surface, now and then consuming a tasty company with one quick dart of the tongue. But the Microsoft Windows world view is dead in the water, and Microsoft has nothing to offer in its place. Windows is a relic of the ancient days when e-mail didn't matter, when the Internet and the Web didn't matter, when most computer users had only a relative handful of files to manage. Big changes are in the works that will demote computers and their operating systems to the status of TV sets. You can walk up to any TV and tune in CBS; you will be able to walk up to any computer and tune in your own files, your electronic life. The questions of the moment are, What will the screen look like? How will the controls work? What exactly will they do? and Who will clean up? As for Gates himself, he is no visionary; he is a technology groupie with a genius for showing up, for being at the right place at the right time. His secret is revealed in that old photo with Paul Allen. He is a man who likes computers very much. Not their intellectual underpinnings, not the physics or electronics, not the art or philosophy or mathematics of software — just plain computers. He's crazy about them. It seems like an odd passion, but after all, some people are crazy about Pop-Tarts. And Gates will be remembered alongside Pop-Tarts, in the long run, as vintage Americana, a sign of the times. A little on the bland side perhaps, unexciting, not awfully deep, not to everyone's taste, but not all that bad. all in all...his idea beneffited both us and him too.